I can't wait to bake! It finally came - my very own copy of "Artisan Bread in 5 minutes a Day". I've seen reviews of this book all over blog land, and decided to give it a try myself. As soon as I got home last night I ripped open the Amazon box and read the first 5 chapters. This is a totally new way to think about bread. I've made bread before - rolls, brioche, cinnamon buns - we even own a bread maker. However, it always requires up-front planning. After my first brioche (3 days of resting, kneading, and development) I loved the final product, but swore I would only make it for very special occasions. Even cinnamon rolls are difficult to make on a Saturday morning if you didn't plan ahead Friday night. But no more - with this book I have a 5-quart Tupperware full of bread dough waiting to be used anytime in the next 14 days. The premise is that you simply mix 4 ingredients (no pre-conditioning the yeast! ), let it sit in a container for 2 hours on the counter-top, then move it into the frig for use later. I ran to Target last night, bought a container, and started in on the dough. I used my kitchen aid for mixing and it took all of 5 minutes. 2 hours later I transferred it to the frig and tonight is my first boule! When it comes to baking you simply cut off a chunk of dough, shape it, and then let it rest for 20-40 minute. Throw it in the oven and 30 minutes later fresh bread for dinner! 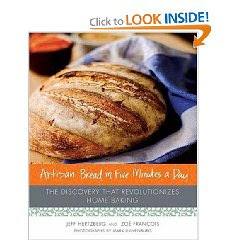 I'm starting with the basic recipe - there are a ton of different breads included in the book: whole grain, ryes, sweet breakfast breads, brioche, bagels, and soft pretzels! Using the basic recipe I should be able to make several types and shapes of bread (including cinnamon rolls!). My second batch will definitely be the bagel/soft pretzel recipe. Imagine waking up and boiling/baking fresh bagels for breakfast before work. I don't know if that's really feasible for us, but I'm going to give it a try! If you're new to bread making or don't like the fuss of traditional methods - I'd highly recommend this book. Tomorrow I'll blog the results of my first boule! Let me know how the bagel recipe comes out for you. I have been experimenting and the first recipe was a disappointment. After boiling and baking they were gooey not chewy. I have another recipe to try but would like to have a recipe that works! I checked out this book from the library and was intrigued. I may buy it if you have good success. I love the ease of the bread machine, but the texture leave a lot to be desired.